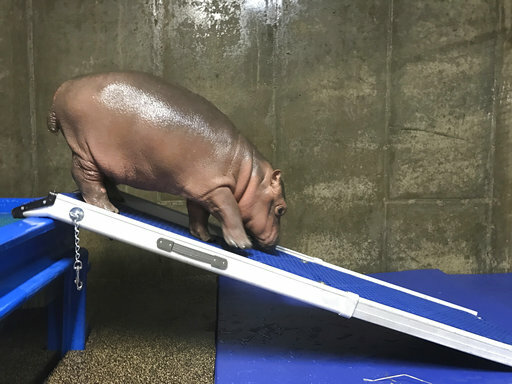 CINCINNATI (AP) — Officials in Ohio have unveiled a mural dedicated to Fiona, the baby hippo at Cincinnati Zoo that beat the odds and survived, despite being born nearly two months early. The Cincinnati Enquirer reports the mural featuring a smiling Fiona and her mother Bibi was revealed recently in the city’s Central Business District. The mural was designed by Lucie Rice, who competed with more than 60 artists to win the Fiona Mural Contest. Rice says she wanted the design to capture the joy surrounding Fiona. Fiona fans had the opportunity to paint the piece along with youth apprentices and teaching artists as part of a fundraiser for the nonprofit ArtWorks. Fiona celebrated her first birthday in January.